Today I want to explore the topic of betting banks, how they work and just why it’s so important you operate one for every tipster or betting system or strategy that you follow. Betting banks might not be the ‘sexiest’ topic in the world to discuss but believe me – they can make a massive difference to your betting bottom-line. I have seen many people fail at betting or make silly mistakes simply because they didn’t use a betting bank. And the daft thing is – it’s so easy to understand and implement, that once you start working to a simple betting bank, you won’t look back! After all anything that can help minimise losers and enhance winners has to be a good thing right! A Betting Bank is a set amount of money that you put aside for each tipster that you follow so as to make you the most effective returns. For each tipster that you follow, you should have a separate and designated betting bank. Without a betting bank in place, the dangers of not coping during a bad run and giving up far too soon are that much higher. Nobody wants to give up on a tipster just before they hit a purple patch, yet this happens all too often for punters without a betting bank in place. Most tipsters will advise staking in terms of ‘points’. This generally varies from 1 point up to 10 points. A Points Betting Bank will tell you how much to stake in real £ or (euros) on each tip. E.g. If you have £1000 and follow a tipster using a 50-point betting bank, 1 point would equal £20. More on this later. For each tipster we monitor, we calculate the optimal amount of points you need to assign into a betting bank. This protects you from losing runs, enhances winning runs, and keeps staking consistent over time. Each tipster stakes differently so this Points Betting Bank (PBB) is optimised for each individual service. This allows you to stake efficiently with the confidence that your Financial Betting Bank (see below) will not go bust. To generate the Smart Betting Club’s own betting bank recommendations, we actually use a special in-house ‘betting bank simulator’ which comes up with a highly tuned figure for optimal returns. So as a member of SBC you know we have your bank and back covered! Of course the amount of money you can actually make from following a service depends on the real-life Financial Betting Bank (FBB) you can apply to it. This FBB amount should be an amount of money you feel comfortable risking in following a particular service. This should be a lump sum of money you have available for investment and should be separate to funds needed for living expenses. To illustrate all these points let’s use a few examples. For each tipster we recommend, we list the Points Betting Bank required for optimal following. You can find this listed each month in our SBC Magazines & Tipster Profit Reports. Let’s take an anonymous example from our archives, a profitable racing service we’ll call Top Racing Tips. If you were a member of Top Racing Tips, we recommend you need a PBB of 100-points. This 100-point figure takes into account historical losing runs, and the current method of staking that Top Racing Tips investments utilises. If following Top Racing Tips over the past 12 months this service would have brought you 235.58 points profit to their advised staking. Let’s say we decide to follow Top Racing Tips with a FBB of £2,500 in real money. 2,500/100 = £25 per point…. £25 is our stake per point. If you had made 235.58 X £25 over the past year that brings a £5,889.50 actual profit. This particular tipster charges £155 per quarter or £430 for a lifetime membership so even if deducting a full year’s subscription, you still would end up nicely in profit. As you can see it is very simple to calculate your own staking. To calculate the financial value of 1pt in your betting bank, all you need do is divide your Financial Betting Bank by the recommended Points Betting Bank, which gives you the amount per point you can financially risk. There is also no harm in starting small with your betting and developing it over a number of years. By doing this you are building a platform for long-term success and it provides a foundation on which to develop your betting further. Our advice is to not feel pressurised to instantly start making thousands of pounds in your first few months, and instead allow the returns to gradually evolve over time. Many of the tipsters we recommend have been with us for some time and will still be here for a number of years at least, so there is no rush to make large sums quickly. A realistic level of expectation will especially help you get to grips with any new services that you decide to follow. By betting to smaller stakes to begin with, you can ensure that each service fits into your lifestyle and that you are able to get the bets on at the required odds. This way you can ease yourself in to each service, become comfortable with their way of working and increase your stakes in line with your confidence in their methods. This article has been summarised from the in-depth Pro Gambler Blueprint we supply to all new Smart Betting Club members, which provides everything you need to set up your betting properly. JOIN SBC TODAY AND ENJOY A NO QUIBBLE 90 DAY MONEY BACK GUARANTEE! 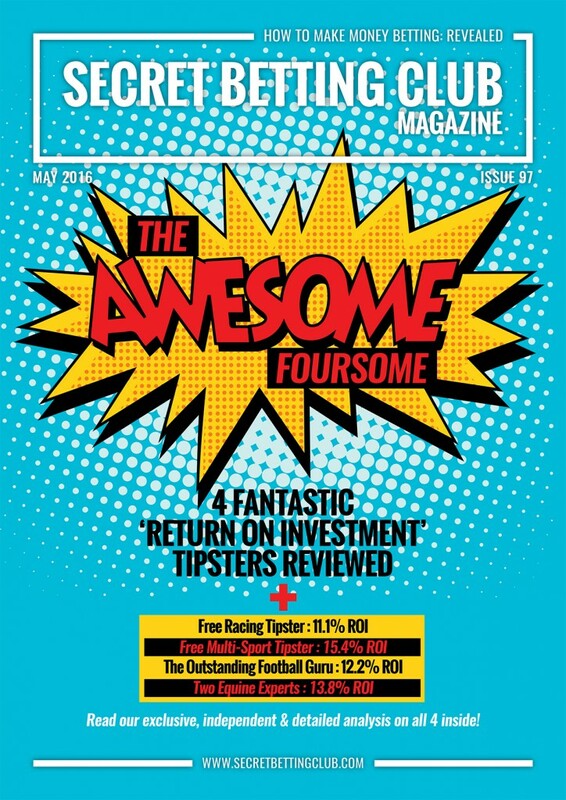 Earlier this week saw the release of the very latest SBC Magazine (Issue 97) featuring our in-depth reviews of an ‘Awesome Foursome’ set of tipsters. All 4 of the tipsters have profitable records across a wide range of sports and betting markets – ensuring that you can find a tipster to suit your needs. This particular tipster offers 2 kinds of service. Firstly – his paid-for premium private service, which is extremely sought after due to the unbelievable profits accumulated over the years. At the last count, his record stood at over 1200 points profit from 1640 bets – all at a ROI of 26.1%. This service is a firm member of our Hall of Fame and many SBC members are currently racking up the profits following his advice in. Secondly – and the focus of our review in SBC 97 is his additional FREE daily nap service, which since 2014 has been highlighting 1 bet a day and all at value prices. All bets are posted online and also via email for free for all to enjoy. Best of all they are only advised AFTER midday and at a time when the markets are fully settled and it is that much easier to get on. This free service has picked up a remarkable record as illustrated by the profit table below. The key figures are the 140.6 points profit and 11.1% ROI. Yes, the service made a loss in 2015, but all of that and more has been accounted for in 2016 and if following long-term it will reap the dividends. It is worth pointing out as well that there isn’t a bet each and every day, which is sensible. Sometimes there is just no value around and he doesn’t tip for the sake of it. You can expect on average around 200 tips a year. If able to take advantage of bookmakers who offer you Best Odds Guaranteed terms on your bets, you can also increase your profits even further by following this tipster. BOG is a very common offer whereby if the SP of a horse is bigger than an early price you take, then your bet is settled at the higher SP figure. E.g. Let’s say for example you placed a bet at 10am on a horse running in the 2.20pm race who is priced at 8/1. The horse drifts in the market and its SP is 10/1 – yet goes onto win. The bookmaker will pay you out at 10/1 if you are eligible for Best Odds Guaranteed. Here is what the record of performance looks like if taking Best Odds Guaranteed – the key figures are the profit of 171 points and ROI of 13.5%. Nice work if you can get it! Alongside this fantastic record – one of the most pleasing aspects of this service is that it is from a bonafide tipster of the highest quality. His paid-for premium service might be out of the reach for some, yet as long as you have a few minutes each afternoon to place his nap of the day, you can easily start to turn a profit. There are a LOT of free tipsters out there, many of whom are here-today, gone-tomorrow (especially on twitter) so it’s about finding not just those that are free, but those that are good. This tipster certainly ticks all these boxes and we were delighted to review it in SBC 97 and showcase to our readers another simple and free way to improve their betting profits. You can read our full analysis on this tipster plus the other 3 experts featured in the latest magazine with an SBC membership. You can also sign-up today and enjoy the peace of mind that comes with our risk-free 90 day anytime money back guarantee if at any time unhappy with the service we offer. If you are considering the idea of starting to make money betting with tipsters, then one of the most important lessons to understand comes in the form of learning how to handle losses. Yes, it might seem odd to read that coming from somebody who edits a site dedicated to ‘making money betting’ but it’s actually one of the most critical parts of a pro punters armoury – coping with bad runs! Sometimes it’s all too easy to get caught up in the idea of winning, without contemplating the possibility of losing. Yet this is what catches all too many gamblers out. Put simply, if you want to win – you have to understand how often you will lose! Allow me to explain more with the help of a couple of professors…. Back in 1979, Professors Kahnemann and Tversky presented an idea called Prospect Theory, which effectively outlined just how we view success and failure very differently. Our decisions it seems are often based on what we can win, rather than what we can lose – even if the end net result is the same. For example, consider two different punters. Punter B places a £25 at 4/1 that wins him £100. He then places another £50 bet that loses. His total profit is also £50. When asked to choose whether they would rather be – the vast majority of people would pick Punter A, despite the fact that both Punters A and B ended up with £50 profit. Its irrational behaviour but it goes to show how the majority of people don’t like losing! This behaviour (or hatred of losing) also feeds back into evidence from studies that indicate that the pain suffered from a losing bet is at least twice as impactful as the joy gained from a winner. So if you watch every single bet you place – there is a great chance you will end up feeling pretty glum unless a very large majority of them win. All of which is why I so often preach the need to be ‘emotionally detached’ from your betting to ensure you can cope with its regular ups and downs. This simply means you don’t get too wrapped up in the success or failure of your bets – treating both winners and losers the same. Your bet wins – great. Your bet loses – oh well… Either way you walk away and don’t let it concern you too much. A classic example of the need for emotional detachment comes when following tipsters. After all – there is often no need to watch a race or football game they have tipped up on. If you trust the tipster to be an expert, it’s not as if you need to double-check they know what they are doing surely? Take for example one tipster I have been in contact with this week as he is offering a free 2-week trial for all SBC members keen to sample his service. He is a long-running Hall of Fame recommended racing tipster of real quality. Long-term his ROI sits at 21% from 13000 bets, you can obtain the odds on the tips he puts up and he is a very fine judge indeed. Yet his approach does need a fair amount of emotional detachment due to his strike-rate of just 14.1%, the fact his average odds are 11/1 and given that he backs all his tips to win rather than each way (as quite rightly long-term this makes the bigger profit). Yet if you flip that strike-rate on its head, it changes from 14.1% of bets win, to 85.9% of bets lose. Yes, 85.9% of his bets lose – That’s 6 out of every 7 – a ratio that some punters if not setup correctly will struggle with. Given this strike-rate, you do need to expect regular losing runs with this tipster. You can easily expect 10, 15, 20 losers on the bounce. And with that can come the issues and ‘pain of losing’ I discuss above – especially if choosing to watch every bet or tally up every loser as they come in. This is where ensuring you are emotionally detached comes in – alongside some sensible betting bank management and a fair bit of patience too. After all, even after a losing run of 20, you would only need two winners at 11/1 to show an overall profit. A couple more at big prices and suddenly that edge jumps significantly. This has actually happened several times with this particular tipster – long losing runs followed by a stream of winners. The trick here is not to panic but stay focused, disconnect your feelings of loss and be confident that he knows what he is doing. He has done it for 8 years after all! If able to get on top of an understanding as to how you as a punter are impacted by winners and losers alike, it will make a significant difference to your betting bottom-line. It might also help give you greater peace of mind and even switch off from your betting when it’s all done for the day. No longer will a winning or losing bet impact your mood – and you will be in a much healthier frame of mind to make sensible betting decisions in the future. If you are after further help with your betting, then you might like to consider a Smart Betting Club membership. Upon subscription you can download our complete ‘Pro Gambler Blueprint’ PDF which is full of salient advice and expertise such as this to help guide you with your betting. By joining this May you can also save £16 on all Smart Betting Club memberships to celebrate our 10-year anniversary. As a punter involved at the sharp end of betting for profit, nothing warms the heart more than seeing the bookies taking a battering – such as the stories in the press this week about the major losses incurred as Leicester won the Premier League. Normally, you have to take stories about bookie losses with a pinch of salt as they are published solely to encourage punters to take less than shrewd bets with them. We see it all the time with accas (one of the bookies favourite bets) and throughout a regular season, there will be plenty of bookie tales of the punter who turned £1 into £50k with a lucky 8-fold accumulator. They simply want you to place more accas as they make plenty more on them than they pay-out long-term. Yet it appears in the case of Leicester City, they have indeed cost the bookies a small fortune in the outright market. I have read estimates in the region of £20 million across the industry with Skybet alone claiming to be £4.6m out of pocket. We will never know the exact figures and bookie PR departments are often guilty of inflating the numbers, but what is clear is that big losses have been incurred. The headlines about these major losses have all referenced the fact it was a 5000/1 winner and whilst there were a few lucky (or shrewd!) punters who took this bet, the biggest liabilities came from those bets placed in the first few months of the season. “It’s bets taken from September to November time, once people have seen a potential remarkable story emerging and that team is still available at a huge price that leads firms to have possible seven figure losses. Many of these bets between September and November 2015 would have seen Leicester available at over 100/1 as many punters stumped up fairly optimistic bets in the hope of a major fairytale win. It is these bets, more than some of the 5000/1 pre-season ante-post bets that did the main damage and just why the bookies took a major hit in this market. Whilst the bookies took a major hit in the Premier League outright markets, what they are being less clear on is just how much money they have made in other markets which haven’t gone to plan this season. Safe to say, you won’t be seeing a bookie on a bike anytime soon! Will Lightning Strike Twice At 2000/1? Given the success of Leicester, how will bookies be pricing up similar teams for next season and is backing 5000/1 shots a genuine way to betting success? Well, the current best odds for anyone to win the 2016/17 Premier League can be found on Sunderland & Norwich at 2500/1 with Betfair, whilst the biggest price for a team confirmed to feature in the top flight next season is 2000/1 on West Brom and Burnley. I actually spoke to one odds compiler for a major firm recently who told me if he had the option, he wanted to run a series of 5000/1 promotions on similar unfancied teams next season to try and tap into the vast number of punters looking to replicate Leicester’s success. He saw the type of punter who takes these kind of bets as those he wants to take on or to put it less kindly – mug money. He couldn’t foresee lightning striking twice and although he took a hit on Leicester, was happy to stick his neck out again. Regardless of how the bookies price up Leicester next season, their success does beg the question – is backing 5000/1 or even 150/1 shots (as Leicester were a few months in) a genuine way to make money betting? Realistically it isn’t and whilst these big winners attract the headlines – they are rarely sustainable and can mislead punters to thinking it’s a route to success. Take one tipster I was asked to look into recently. He specialised in ante-post betting, usually at odds of between 16/1 and 40/1 and on the face of it, had a great record with 20.5% ROI from 650 bets over the course of 3 seasons. Ultimately though, his success came off the back of a few good winners back in 2013 at 20/1 (twice) & 33/1 and all told, that year’s returns accounted for 89% of their current total profit. 2014 made a small profit, whilst 2015 showed a similar sized small loss and it is only 2016 which has made any further headway, thanks largely to a placed bet at 50/1. Had you followed them just in 2013 then you would have been very happy indeed. The likelihood however is this tipster became popular thanks mainly to their performance that year and those joining subsequently have yet to see the returns they hoped for. Ultimately, we decided not to review this tipster as it doesn’t fall into the category of those we feel can make sustainable and reliable long-term profits. Yes, it may enjoy occasional success but would you wait 3 years to turn a profit? Was the success in 2013 a one-off? Similarly, if choosing to back a side next season at 2000/1 in the hope they will replicate Leicester’s success – you might have to wait a very long time indeed to see the fruits of this labour. It might be worth throwing a few quid on as many punters did as a ‘fun bet’ but certainly isn’t a particularly realistic option to make you money punting long-term! If you are looking for professional, dedicated help with your betting then you certainly might like to consider a Smart Betting Club membership. We provide you with all the tools and expertise you need to find the right tipsters – those that can make you money betting. You can get started right away with instant access to the full SBC service and best of all, throughout May you can save £16 on the cost of membership. This is part of our 10 year anniversary celebrations. £16 Discount On ALL Memberships This May: 10 Year Celebrations! May 2016 represents a unique milestone in the history of the Smart Betting Club as its our ten-year anniversary of service and to celebrate we have a really special offer for you! Ten years is a long time in any business, yet it is a lifetime in the tipping world – so how have we lasted the test of time? We like to think this is down to our independent review stance and the unique way in which we are funded, which allows us to tell it like it is. So rather than making a cut from sales of the tipsters we review (which is how all other review sites work), instead we charge you a membership fee for access to our reports and magazines, which allows us to be independent. Ultimately this means we can tell you the truth where others won’t. If we don’t rate a tipster, we will tell you – regardless of how much money they might offer us to say otherwise. Thus ensuring you can trust our opinion at all times on just which tipsters can make you money betting. Over the course of the past 10 years we have helped many people with their betting, yet recently one member emailed in with details on his own unique journey from perennial loser to long-term winner. His name is Steve and he has been a member of the Smart Betting Club since May 2014. I took no action and ignored it – but I couldn’t get it out of my mind. I started to wonder if there was some organisation that rates/monitors these racing clubs/tipsters. A month or so later I started to ‘scratch that itch’ and did some research on-line and eventually stumbled on a blog called ‘The Portfolio Investor’ written by Rowan Day. Here for the first time – I learnt that following a portfolio of carefully chosen tipsters could be profitable – with a fair degree of patience and discipline. Rowan also mentioned ‘The Smart Betting Club’ in fairly glowing terms, so I looked them up. It’s worth pointing out that I’ve not been a fan of horse racing – or gambling for that matter and up to this point – had only dabbled with very small stakes (up to a fiver). So the idea of parting with £79 to join ‘The Smart Betting Club’, wasn’t an easy decision – £79 was (and still is) a lot of money to me! But after a couple of month’s deliberation and further reading of Rowan’s blog, I took the plunge on 1st May 2014 and paid my £79 to join. There was a money back guarantee after all, so what had I got to lose? Steve’s story is similar to many other Smart Betting Club members I have had the pleasure of speaking to over the years. After all, over 85% of those surveyed in our end of year members poll told us they made a profit in 2015. So why not take the plunge this May, save yourself £16 and enter the world of professional betting.